A trip to Nassau, the Bahamas. What’s not to like? A trip for 2 to Paradise Island. And more specifically- Atlantis and its associated properties. 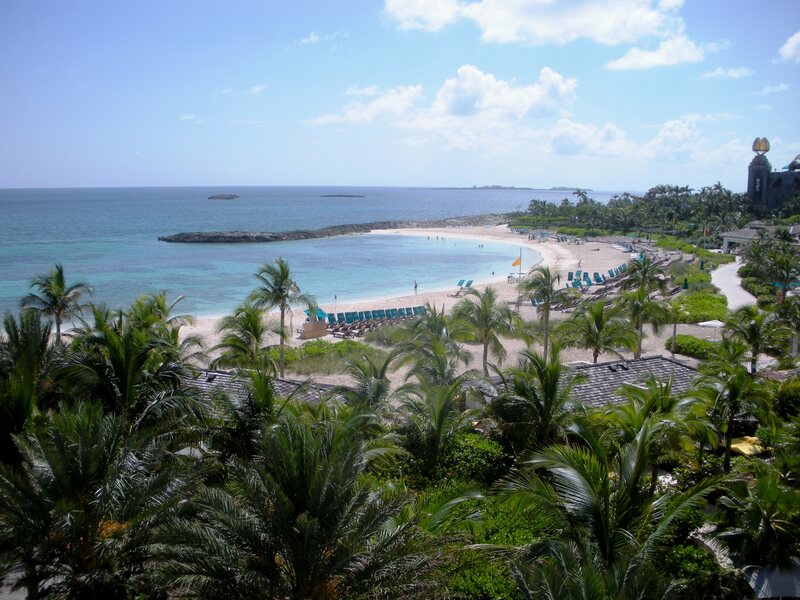 Atlantis Resort, the Reef, the Cove and the One & Only Ocean Club. Nassau has this real jet-setter feel to it. It’s a stones throw from Florida. Miami to Nassau is 179 miles. Jet boats, yachts, the Bahamas Express and more head over to the Bahamas with relative ease. Flights from Florida are about 55 minutes and flights into Nassau from around the world are plentiful. The Bahamas is an independent nation but as a former British colony, its roots and traditions are very British. As you drive into Nassau, you feel like you are in a tropical, seaside England. Blackbeard once called the Bahamas home and now many a celebrity do as well including Mariah Carey, Sean Connery, Johnny Depp and others. 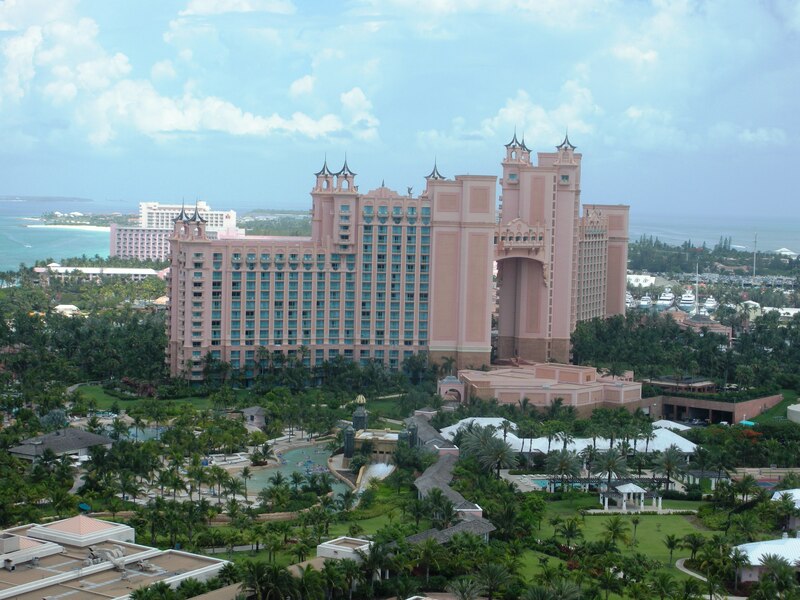 As we cross the bridge to Paradise Island, the Atlantis Resort and its Royal Towers stare you down. Officially opened in 1998, the resort was created by South African hotel magnate Sol Kerzner and his company (think “Sun City” in south Africa). Its a large property and now contains the 3 towers of Atlantis Resort, the Reef Tower, the Cove Tower and the Harborside Resort. They’re all very distinct. You can easily stay in your own little area or wonder the full property and take in all it offers- numerous dining choices, 11 pools, 3 beach areas, dolphin cay, water park, marine habitat and more. Atlantis is very much about the experience. Although its a large property, it has a comfortable feel to it. The Atlantis experience also includes a spa, 5-star restaurants, activities and entertainment. On the weekend we were there, Justin Bieber was too. Performing and wandering the resort with his entourage. Every few weeks there is a featured performer in concert to draw fans from North America. You get a fairly intimate venue and perhaps the chance to bump into that same celebrity on the property. I didn’t have a chance to play golf but the Ocean Club Golf Course gets rave reviews (ranked #8 Resort Golf Course by Golf Digest). Food is everything and the dining reflects that. Buffet breakfasts, snacks and casual dining are all exceptional. So is the fine dining. We had great dinners at the Bobby Flay Restaurant (Mesa Grill) and Cafe Martinique. While its easy to get drawn into the glitz of the bigger than life resort, it still comes back to the water for me. The Dig (one the world’s largest walk through aquariums) is one of the most amazing fish viewing experiences anywhere. Fish, eels and sea life of almost every kind abound. As a water thrill, the “Leap of Faith” a.k.a. Shark Slide, has no equal. As you jump into the tube at the top, you must cross your feet and fold your arms (lest they be ripped from your torso). You drop 60 feet at breakneck speed through a glass tube with sharks racing around you (or so it seems). At the bottom, you are dumped into a pool and immediately think “ok, that wasn’t as bad as I thought”. But at the end of the day, it’s all about the beach. The beaches are gorgeous and the water is perfect. That’s all I need. Of course, there is more to the Bahamas than Nassau, but it’s a great place to start.